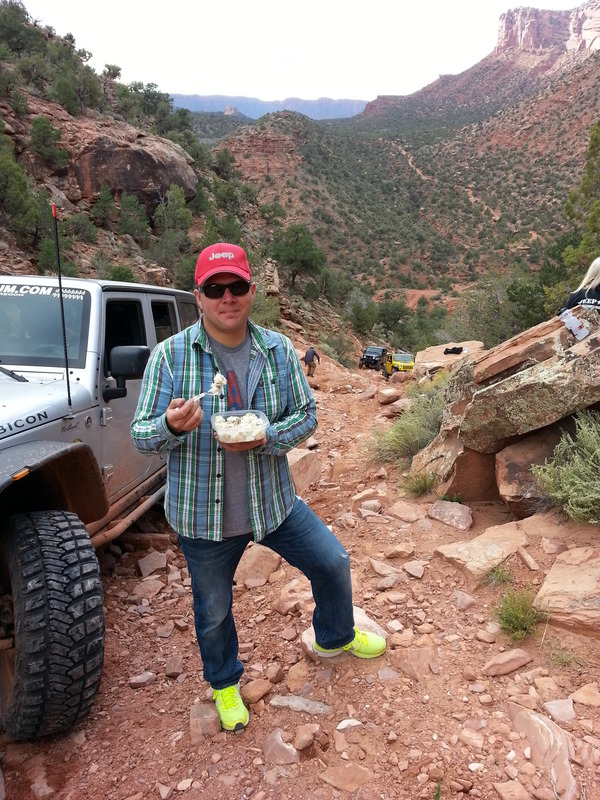 Me enjoying this salad in Moab, UT. Okay, make fun of my shoes then move along. When we are on the trail, one of our fav things to toss in the ARB is some potato salad. Its pretty easy to make, keeps well, and is filling. While we were in Moab, Melanie made up a batch of my FAVORITE potato salad, from the Cornucopia Restaurant cookbook. This is the best vegan restaurant in Dublin, Ireland and is my staple (the staff remember me, how scary is that) every time I am there. So, buy their book! Whip up a batch of this amazing salad! Preheat the oven to 180 C. Spread the hazelnuts on a baking tray and roast them for 8 minutes. Set them aside to cool and then rub them between your hands to remove the loose skins. Chop the baby potatoes into bite-sized pieces – either halves, quarters or slices, depending on how big they are. Place them in a large pot, cover with lightly salted cold water, bring to the boil, cover and simmer for 15 minutes or until tender. Drain and set aside. Meanwhile, make the dressing by blending the mayonnaise, lemon juice, and garlic with a stick blender or in a food processor. Season with salt and pepper. When the hazelnuts and potatoes are cool, place them in a large bowl. Chop the parsley and add it to the bowl, reserving a little for garnish. Fold in the dressing evenly, taking care not to break up the potatoes. Serve sprinkled with parsley with a crisp green salad.